Is it a bird, a plane, or SuperCEDEC®? Over many years, Cedec® has built its reputation as a reliable self-binding gravel, but as with all self-binding gravels, it's less than ideal for certain high traffic locations or for areas adjacent to hard paving. However, the new SuperCEDEC® has been specifically developed to overcome this shortcoming, and it looks set to become a popular choice for many landscape designers. The new product is based on the original Cedec aggregates, but is enhanced with what are said to be "natural and organic additives to produce a firm surface that is resistant to scuffing and being kicked around"
Not only is the new SuperCedec stable, it is permable, and so ideal for use on urban pathways, tree pits and similar projects. CED, the Essex-based stone and aggregate supplier behind the product, have trialed and tested SuperCedec over the past two years and the results have led to the product being supplied for use in projects across Britain. 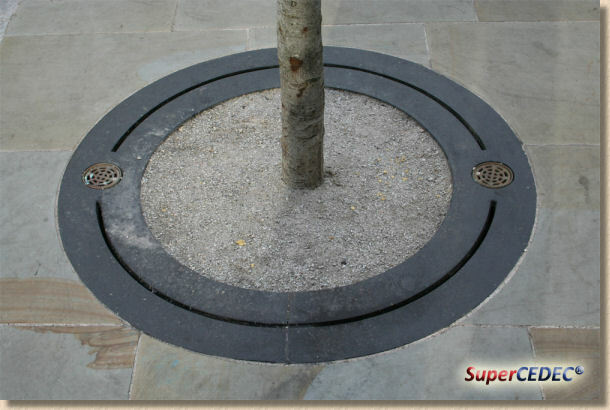 For example, SuperCedec® Red was chosen by Robert Myers Associates as the surface for two extensive tree pits with quite heavy pedestrian usage at Hereford Cathedral. The standard Cedec® was also used for less sensitive areas around the Cathedral, which has resulted in a pleasing, overall uniform appearance. 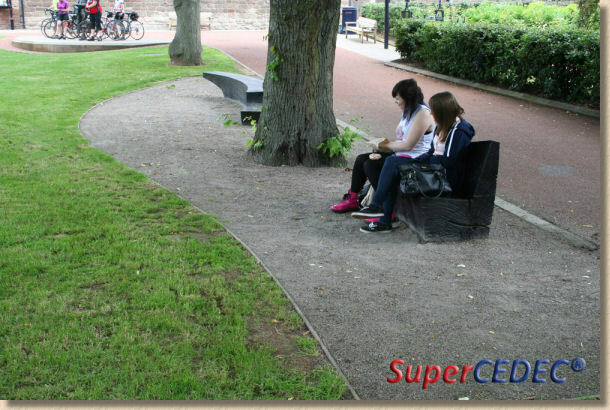 We specified red SuperCEDEC for the informal seating areas beneath mature trees in the Close at Hereford Cathedral, where a firm but permeable surface was required. The material has withstood heavy use and has held its shape well; it has formed a natural looking, hard wearing, porous surface that appears entirely at home in its historic surroundings. SuperCedec® Gold was also chosen to be laid at a medical centre in Hull which came about after the design architects expressed concern about the new tree line and the need for a suitable pathway material that would provide access along the trees while giving free drainage. Although SuperCedec has been developed primarily for pedestrian application, occasional use by emergency vehicles, cars, lorries or maintenance equipment should not cause any significant damage, providing the laying instructions have been properly followed. CED claim that to get the best from SuperCedec it really needs to be rained and walked upon, so it's ideal for the British climate! Even better, it will also function undercover if regularly watered. Available in three colours; gold, red and silver, SuperCedec is stocked throughout CED's nationwide depots. For prices and further info please contact your local depot. For a copy of the laying instructions and maintenance advice please click here.